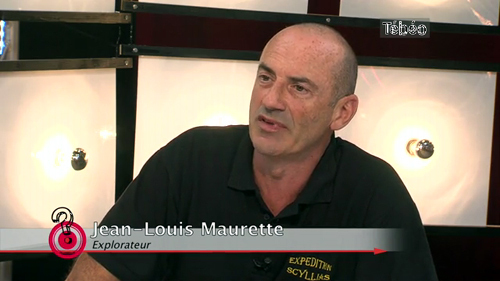 On October 3, 2013, l'Expédition Scyllias team was invited to Brest by the French television channel Tébéo to participate in the broadcast Quoi 2 n9uf ? compèred by journalist Xavier Patrigeon. It was an opportunity for contributors to discuss a land expedition in Russia, but also the underwater world and the main quest of the association : contemporary shipwrecks and maritime history. 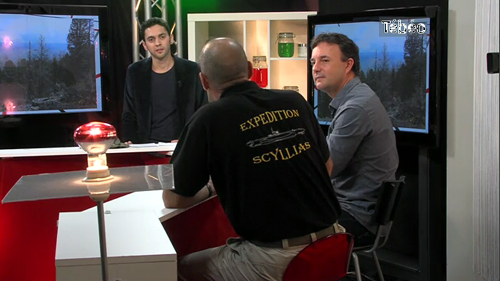 On the left : Jean-Louis explains the secrets of the land expedition and objectives of l'Expédition Scyllias. On the right : the set.